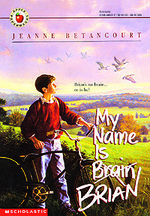 2 posts categorized "My Name is Brain Brian"
Brian is a terrible student. His family think he's lazy. His fiiends think that's just fine. In fact, they think some of the things Brian does are really funny - like writing his name Brain intead of Brian. But Brian isn't trying to be funny. He knows he isn't lazy. And he's tired of feeling stupid, tired of working and working to learn things, to get words right, and never even knowing he's gotten them wrong. When a tough new sixth-grade teacer focuses on Brian, he's sure that now, he will always be the class dummy. That's how Brian's sixth grade adventure begins.